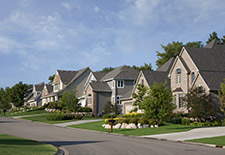 Flower Mound Property Management, Flower Mound Property Managers, Flower Mound, TX Property Management Companies. Flower Mound is an incorporated town in Denton and Tarrant counties in the U.S. state of Texas and a suburb of the Dallas–Fort Worth metroplex. Located northwest of Dallas and northeast of Fort Worth adjacent to Grapevine Lake, the town derives its name from a prominent 12.5-acre mound located in the southern portion of the town.